Your lawn represents a significant investment in both time and money. Turf pests, such as insects or small animals, can quickly damage or ruin a lawn. Your greatest defense against these pests is knowledge. When you know how to look for them and identify their signs and symptoms, you can stop them before any real damage occurs. Many common turf pests, such as moles, are some of the most frustrating to deal with. The pages below will offer advice and suggest ways to solve the problems. We will also examine homemade cures if any exist for that particular pest. Insects are an important part of nature and are found in almost every square inch of earth. No matter how we feel about them, life on earth would suffer if they were not here. However, even a good thing that is out of place can prove disastrous. Termites, for example, provide a valuable service in the forest, but they cannot be allowed to do the same thing to our homes. Ground wasps feed on small insects, but must be destroyed when the nest is a danger to children or pets. It is no different for our lawns. Since we have an investment in our lawns, we need to protect it from damaging turf pests. Beneficial insects are those that provide a needed service. Bees pollinate plants and spiders help keep other insects under control. These are just a couple examples. Nuisance insects are usually more of a problem for us than they are for the grass. They include ants, spiders, adult green June bugs, wasps and hornets, etc. In most cases, little or nothing needs to be done about nuisance insects unless their presence becomes an annoyance or a danger to us, to our children, or pets. Turf damaging insects are those that feed on the grass blades, stems, or roots and can harm your grass. These include leafhoppers, chinch bugs, billbugs, etc. Generally they are not a danger to us, just the grass. However, just because a lawn-damaging insect is found does not necessitate treatment. Healthy grass is easily able to withstand insect pressure within certain limits. It is only when they exceed the threshold that treatment may become necessary. Most of the insects that damage the grass roots and crown are the larval stage of certain beetles and moths. This also means there is a narrower window of opportunity to control the insects. Turf damage doesn't usually occur until the last stages of larval growth. 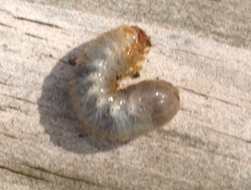 Examples are white grubs, cutworms, and army worms. Fortunately, we know when the damage is likely to occur, so that is important for good control. Insects that feed on plant juices are referred to as sucking insects. Aphids, leafhoppers, chinch bugs and mites can cause considerable damage especially to stressed or young plants. Some sucking insects can spread diseases to plants as well. Since sucking insects live on plant juices, over-fertilized, nitrogen rich lawns will often receive the most damage. In years past, insecticides were much different than they are now. Popular insecticides like chloradane, heptachlor and others were commonly used to kill tree insects or turf pests. They had a very broad spectrum and a long persistence. The term "broad spectrum" means they controlled a wide variety of turf pests and "long persistence" means it remained active for long periods. One application would last all season and quite often would last well into the second season. Due to the long persistence, a person didn’t need much knowledge of insect growth stages or behavior. The insecticide was going to kill the insect sooner or later. Although effective, the long persistence became a concern and by 1980 almost all were off the market. Newer insecticides are developed to be active for much shorter periods. Most will remain active for just a few days while a few others are persistent considerably longer. They also have a narrower spectrum. This can have a significant outcome, especially if we misidentify the damage or the tree or turf pests. More attention and research has been given to biological controls. These are often insect specific and must be applied well in advance of any turf damage. What These New Insecticides Mean For Us? With newer insecticides, controlling turf pests means we must be more accurate at identifying the insect damage. If we are using a preventative insecticide before any damage occurs, we need to know when to apply it for best results. We also need to know what is the best product to use. This section will show you how to identify problem insects and methods of control. It doesn’t matter if you are a golf course superintendent or a homeowner, the methods are the same and knowledge is the real key.